Life can be a confusing, swirling morass. Some people turn to religion for guidance, whereas others consult astrology. If you are one of the latter, Vital Acts would like you to turn your gaze to their Lifestyle app, AstroSwami MAX. Using a plethora of personal information, AstroSwami MAX will create a personalized horoscope for you based on Vedic astrology (known as “Jyotish” in its native India), Western astrology, and numerology. To create a profile, AstroSwami MAX requires information such as birth date and time from you. With it, the app will generate Vedic facts about you, a birth chart, and a detailed description of you based on number analysis (all found under the Astro ME section in the Horoscope tab; look at the individualized tabs at the top of the screen to switch between descriptions). 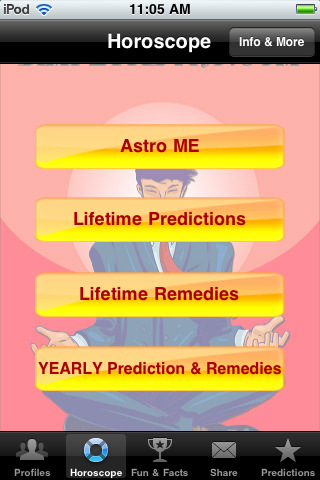 Also under the horoscope tab are all the predictions for your future, from now until 2040, including remedies you might want to consider to stave off or treat all the maladies you’ll be besieged with (according to the stars). In the Fun & Facts tab, you can find your zodiac sign and read about all its characteristics, harmonize your name (based on birth date), read random quotes about love, and find your Panchang (a part of Vedic astrology that helps you synchronise with your best days and times, so you know when to be at your best). Finally, the Predictions tab holds all the zodiac foretelling for yesterday, today, and tomorrow; it even includes the tarot card for your name. For these predictions, notice that you scroll through the upper tab to get to more options. AstroSwami MAX is chock full of extremely interesting information–if only I could understand half of it. I probably enjoy astrology a tad more than the usual suspect, but the fact that this app is powered by 85% Jyotish throws my Western/Chinese astrology roots for a loop. I don’t know what a Sade Satti is, and I don’t know what to do with it. A link to some descriptor would probably be helpful, otherwise I’d be Googling every other term. The writing could use a touch-up: actually, the entire app could do with a make-over. The way it is put together is a bit amateurish–having tabs on top of the screen is a horrible idea, as they can interfere with the Back and Forward buttons–and messy, and the color schemes are not very exciting. I’ve been to the website, so I know someone (or someone hired) can design–please throw some app work their way. However, if you’re not there for the app’s looks, you’ll be plenty occupied with reading about your future on AstroSwami MAX. It has one of the most complete accumulation of charts and analyses I’ve ever seen in an astrology app, but much of it is not Western. If you’re into Vedic astrology, then you might want to try AstroSwami MAX. It’s very pricey ($7.99), but you’re paying for potentially valuable information. AppSafari review of AstroSwami MAX was written by Julie Guan on December 17th, 2010 and categorized under App Store, Calendar, Fun, Reference. Page viewed 3981 times, 3 so far today. Need help on using these apps? Please read the Help Page.